The early followers of the Buddha did not depict him in human form. The first representations showed only his footprints, the open umbrella of royalty, the riderless horse, the empty seat beneath the tree where he realized nirvana, or the wheel and the stupa that came to symbolize his teachings. 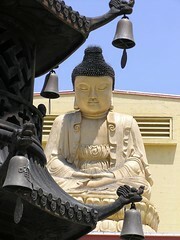 The first images of the Buddha began to be made in central and northwest India in the first century CE. 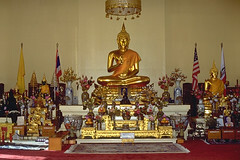 Since then, the Buddha seated in meditation has become the most instantly recognizable image of the Buddhist tradition. There are colossal images of the Buddha carved in stone, refined golden images of the Buddha found in temples, and tiny images of the Buddha on charms and amulets. The Buddha is depicted in several postures—standing, sitting, or reclining—and with stylized hand-positions called mudras. Most commonly the hands are palms cupped up in the lap. When the right hand touches the ground, the Buddha is calling the earth to witness his steadiness in the face of temptation. When the right hand touches the fingers of the left at his chest, he is teaching. The image of the Buddha is the focus of reverence and gratitude, even devotion, but not worship as such. At the front of a meditation hall in Cambridge, Massachusetts is an altar bearing a single image of the Buddha. Those who meditate there bow toward the image three times to honor the three treasures—the Buddha, the Dharma, and the Sangha. 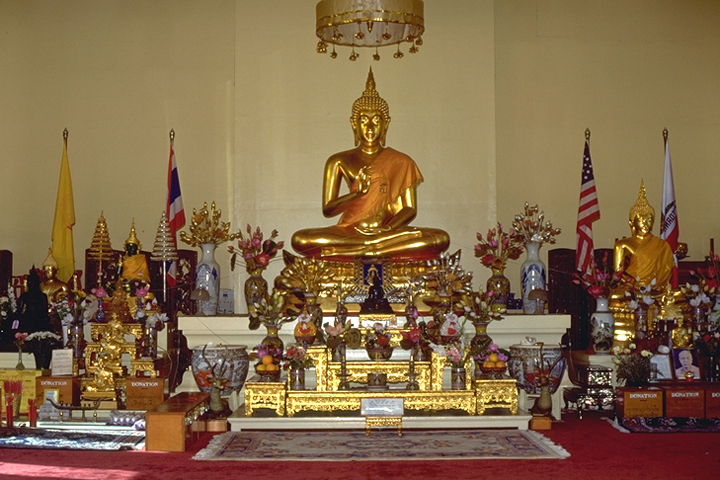 At Wat Thai in North Hollywood, the golden image of the Buddha is flanked by the U.S. flag and the flag of the state of California, along with a multitude of smaller Buddha images and flower offerings. On festival days, incense is lighted, and the laity offer small squares of gold leaf on an image of the Buddha in the courtyard outside.